PezCycling News - What's Cool In Road Cycling : EUROTRASH Fabio Monday! Young Fabio Aru won a very tough Vuelta a España with a refreshing attacking style, but you have to be impressed/sorry for by Tom Dumoulin. We have all the results, rider quotes and video from Spain. The Tour of Britain and the WorldTour races in Québec and Montréal also feature in today's very full EUROTRASH Monday along with rider contract and injury news, World Championships schedule and how not to be aero. Large coffee time. In the end the 2015 Vuelta a España came down to who had the strongest team and that was Astana. Tom Dumoulin fought hard with the team he had, but it was fashioned round the talents of John Degenkolb and not for a GC rider in a very hilly race. Fabio Aru had a very strong team behind him, but his ride in the time trial saved his chances in the overall competition, unlike Joaquim Rodriguez who dashed his chanced in the stage against the clock. In stage 20 the Astana team had a plan and they executed it to the letter and Dumoulin stood little chance against overwhelming odds. Was it a good 2015 Vuelta? Very much so. There was probably only two stages that were not exciting or didn't have a surprise in the finalé. Did we miss Cavendish, Kittel and Greipel? No, not at all. The race might have been better if it hadn't lost Sagan, Nibali and Froome, but it also might have been more negative as all the top riders watched each other. Again la Vuelta makes a strong bid as the best Grand Tour of the season. Viva la Vuelta and happy 80th birthday. 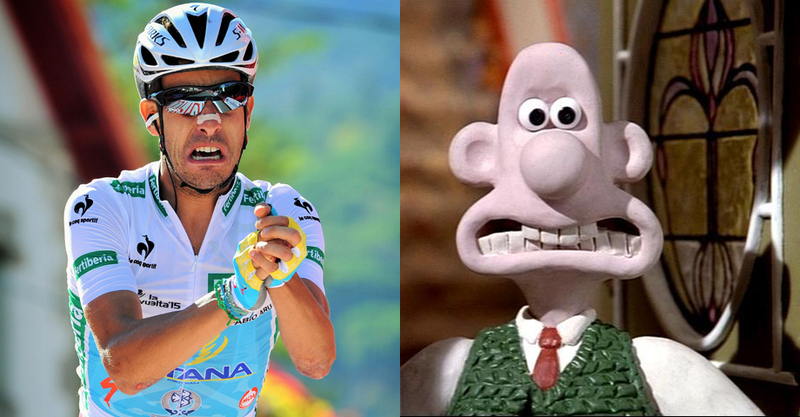 Good for Wallace... eh Fabio! Nicolas Roche gave Team Sky the victory they were longing for in this Vuelta when he won Stage 18 while Tom Dumoulin (Giant-Alpecin) held off his main rival to retain the overall lead. Ireland’s Roche beat breakaway companion Haimar Zubeldia (Trek) in a two-man sprint after leaving the escape group on the last climb of the 204km ride from Roa to Riaza. Jose Gonçalves (Caja Rural-Seguros RGA) took third place 18 seconds behind while Alejandro Valverde (Movistar) won the sprint of the favorites’ group to end up fourth, 38 seconds off the pace, as Movistar took over from Sky at the top of the team classification. Overall, Dumoulin still leads Fabio Aru (Astana) by three seconds after the Italian climber repeatedly, but unsuccessfully, attacked on the last climb. Joaquim Rodriguez (Katusha) remains third, 1:15 adrift of Dutchman Dumoulin. A group of 25 riders formed the day’s breakaway: Roche (Sky), Minard (AG2R-La Mondiale), Atapuma (BMC), Gonçalves & Madrazo (Caja Rural-Seguros RGA), Lemoine & Rollin (Cofidis), Serry (Etixx - Quick-Step), Courteille (FDJ.fr), Pellaud & Reynes (IAM Cycling), Durasek (Lampre-Merida), De Clercq, Hansen & Van der Sande (Lotto Soudal), Rojas (Movistar), Jim (MTN-Qhubeka), Cardoso (Cannondale-Garmin), Cousin & Gautier (Europcar), Vorganov (Katusha), Roosen (LottoNL-Jumbo), Bennati & Poljanski (Tinkoff-Saxo) and Zubeldia (Trek). De Clerq’s presence in the break, though, was a threat to Meintjes’s 10th place in the GC and his MTN-Qhubeka team controlled the gap, which rose to six minutes. Astana took their share of work with about 50 kilometers to go. Vicioso launched an attack meant to serve as a launchpad for Rodriguez, who joined him shortly afterwards, but both were calmly reined in by the Astana-led peloton 35km from the finish. On the last climb on the 10 kilometer Puerto de la Quesera, Roche dropped his breakaway companions before being joined by Zubeldia. At the beginning of the ascent, Aru attacked the group of favorites but Dumoulin managed to stay in his wheel. Chaves (Orica-GreenEDGE) then jumped away from the red jersey group and was joined by Nieve (Team Sky), Valverde (Movistar) and Majka (Tinkoff-Saxo). But they regrouped and the red jersey pack caught most of the fugitives in the final descent, with only Roche, Zubeldia and Gonçalves staying ahead. Full race report and result HERE. Stage Winner, Nicolas Roche (Sky): “When he caught me we agreed that if we wanted to make it we had to work together. I was expecting he would try to attack with three or four kilometers to go, but we shared the load to get to the finish we had information that there was (Gonçalves) 15 seconds behind. There was no time to mess around. Coming into the last sprint… Haimar is someone who has a lot of experience, I’ve lost a few sprints against him in San Sebastian and other races over the years and even though I’m supposed to be quicker on paper, I thought I might as well control the sprint and keep it a high speed rather than do a start-stop sprint. I’m pretty sure I already have a message by now. We’ve had a great relationship over the years. I really gave 100 per cent this year and ever since we rode together I think he was very supportive of me here, attacking and trying things. I thanked him for letting me attack on the first day and he knew I was in a good shape. It’s really great to be able to make the most of it actually because I don’t have a lot of opportunities. I tried on the first week and the second week happened… It took me a few days to recover. Luckily enough the team gave me a day off yesterday with the time trial. I’m welcoming the end of the season but I also said that there were still four stages to fight for and the team had in mind to fight for it. We did say we were going to focus on stages and try to help as much as possible Nieve to defend his 8th or 9th place and maybe help move him up (in GC). Today the team was very active to go in the breakaway. It was quite difficult because it’s pretty clear that ourselves and Movistar are playing for the team GC and the break is not going to go until there is one of each. We’ve had a few days of misfortune, it was a big blow losing Chris, it was also tough for me to drop out of the GC and to go through three or four days of pain with my hip but we also had some good days. Mikel has done some excellent climbing, we’ve had Boswell finishing third in Andorra, Puccio was also second in a mountain stage, there was a lot of active riding and being aggressive. It was good to see more aggressive racing from Team Sky on the Vuelta. It wasn’t the Vuelta everyone thought of when we arrived but it’s definitely not a bad Vuelta. I came to Team Sky with a role, I was there to give support to Porte in the first part of the year then I had to focus on Chris on the second part and then to have a little bit more of freedom around the Vuelta. We’ve won a lot of races this year, it was great to be part of it. A lot of pressure, different pressure, different roles, there was something that I enjoyed." Dave Brailsford (Team Sky manager): "Nicolas came here well prepared, he worked a lot this year. After his crash it was over for him in the GC but he’s recovered well and everybody is happy for him, he’s a super lad. Mikel also rode well. We now have won stages in the three grand tours this season, something we didn’t achieve in 2014. When you’re near the end of a grand tour, especially after riding the Tour de France, the challenge is more mental than physical. Today he made everyone happy." Overall leader, Tom Dumoulin (Giant-Alpecin): "Aru’s first attack definitely hurt but I always kept his wheel and I was never cracking or was never in real trouble. He also had a bad moment so he also has to be careful with his energy. I think it was a good day. They are trying to isolate me and attack me but I know that if I just stay in Aru’s wheel there is no problem. I think Aru will not be so happy about today so it’s a good thing." Arnaud Courteille (FDJ.fr): "I had been fighting for a place in the breakaway for a few days. It was a fast start. I am happy I was in the front but I came up short in the finale. In the last climb I was not as well as in the previous two or three days." Break rider, Songezo Jim (MTN-Qhubeka): "It took some time for the break to form today but when it did, I was happy to be up there representing my team. I didn’t really have a great day in the office though, the legs just weren’t there. I hope I can feel better than I felt today in the next few days as we continue to support Louis for the general classification." 10. Domenico Pozzovivo (Ita) AG2R-La Mondiale. 10. Louis Meintjes (RSA) MTN-Qhubeka at 6:51. Tom Dumoulin (Giant-Alpecin) extended his overall lead in the Vuelta to 6 seconds after the Dutchman attacked in the finalé of the Stage 19 won by the classy Alexis Gougeard (AG2R-La Mondiale). Dumoulin made his effort 2 kilometers of the finish on an uphill cobbled section, gaining 3 seconds over Fabio Aru (Astana) and Domenico Pozzovivo (AG2r-La Mondiale) as he crossed the line with Dani Moreno (Katusha) 16:18 behind Gougeard. Gougeard, the strongest of the day’s breakaway, went solo on the last climb and never looked back to beat Nelson Oliveira (Lampe-Merida) by 40 seconds and Maxime Monfort (Lotto Soudal) by 44 seconds. The group featured Knees (Sky), Gougeard (Ag2r-La Mondiale), Moinard (BMC), Arroyo & Vilela (Caja Rural-Seguros RGA), Lemoine (Cofidis), Duarte, Duque & Valencia (Colombia), Bouet (Etixx - Quick-Step), Delage (FDJ.fr), Coppel (IAM Cycling) Oliveira (Lampre-Merida), Monfort & Van der Sande (Lotto Soudal), Amador & Ventoso (Movistar), Berhane (MTN-Qhubeka), King (Cannondale-Garmin), Engoulvent (Europcar), Machado & Vorganov (Katusha), Brutt (Tinkoff-Saxo) and Irizar (Trek). Before the halfway mark, Aru, as well as Puccio and Degenkolb, were involved in a crash. All were quickly back on their bikes but Aru called for the medical car and the peloton slowed down, allowing the breakaway’s lead to rise from 13:30 up to 15:40. Dumoulin was held up behind the pile-up and broke his bike as he avoided Degenkolb. The Movistar team piled the pressure in the ascent to the Alto de Paramera but they could not shake off Dumoulin. Machado was the first to try his luck solo from the breakaway group but he was caught by Gougeard and Duque. The Frenchman went on his own 22km from the finish and Monfort, Amador, Moinard and Machado narrowed the gap to 15 seconds 10 kilometers from the line. Gougeard has a big engine, though, and he accelerated once more to end the chasers’ hopes and claim his maiden stage win on a Grand Tour. In the pack, Rossetto (Cofidis) crashed but made it back to his bike while Courteille (FDJ.fr), who also hit the deck, was taken to the hospital with a suspected collarbone fracture. With nine kilometers left, Valverde also tried to distance Dumoulin but he was reined in 1.2km from the line. Stage winner, Alexis Gougeard (AG2R-La Mondiale): “Once again it was a fast start and I did not really believe in my chances. I eventually made it into a 24-man group. I first spared myself a little. I had in the back of my mind a few mistakes I made when I was alone in front and was caught not far from the line. I did not panic when Machado attack. I waited the last moment to produce my effort. It’s a bit far from the line indeed. I knew that if I made it to the top with 20 or 30 seconds, I would have a chance. When they narrowed the gap to 15 seconds I had doubts but I told myself ‘now that you are in this situation, you give everything’. I was not sure I’d win until the last moment. In Avila, with the cobbles and the crowd, I could not hear what my sports director Didier Jeannel was telling me. I could not understand a word, it was stressful. It’s the most beautiful victory of my career, the first in a grand tour. I am really happy. For my team, this Vuelta is a success even if Domenico Pozzovivo does not have great sensations. It’s a reward for what we’ve been doing since the start of the season. I can climb well on short ascents now. I lost weight and I realize it’s easier. I climb better and today I was not afraid of the last ascent. There were days when I almost abandoned. I’ve had rough days, being on the verge of pulling out, especially after I was in the breakaway and was reined in 500 meters from the line. The rest day did me good but if I had been told I would win a stage a week later I would not have believed it. I had been better since the time trial in Burgos. I had this stage in mind. It’s a big satisfaction. Since the beginning of season I have not taken part in many World Tour races, only the cobbled classics, which are not easy when you don’t have the experience. I would like to win in the classics and in the grand tour being the aggressive rider that I am. I am not going to change. I need to know how to spare myself a little to be there for the end game." 6th overall, Alejandro Valverde (Movistar): “When you have nothing to lose, you try, and try… and try again. We have tried today, why not tomorrow”. 10. Francisco Ventoso (Spa) Movistar. 10. Louis Meintjes (RSA) MTN-Qhubeka at 7:09. Fabio Aru was poised to win the Vuelta after Astana’s perfectly executed plan ended the hopes of Tom Dumoulin as Ruben Plaza Molina claimed an impressive solo win on home soil in Stage 20. With only tomorrow’s procession to Madrid left, Aru, who was six seconds down at the start, leads Joaquim Rodriguez (Katusha) by 1:17 and Majka (Tinkoff-Saxo) by 1:29 after the Pole attacked with Quintana (Movistar) on the last climb to the Puerto de Cotos. Quintana is fourth (2:02) ahead of Chaves (Orica-GreenEDGE, 3:30) as Dumoulin slipped to sixth (3:46). The Giant-Alpecin rider, who had looked solid all week, cracked when Aru attacked in the penultimate climb and the Italian, helped by a few teammates, crushed the pedals to make sure his main rival would not see him again. An early crash involved Sicard and Rolland (Europcar), Torres (Colombia), Gerrans (Orica-GreenEDGE) and Danny van Poppel (Trek) but all were quickly back on their bike. Shortly afterwards, Plaza (Lampre-Merida), Le Gac (FDJ.fr), Hansen (Lotto Soudal), Venter (MTN-Qhubeka), Warbasse (IAM Cycling), Navarro (Cofidis) McCarthy (Tinkoff-Saxo), Gonçalves (Caja Rural-Seguros RGA), Vorganov (Katusha), Rubiano (Colombia) and Arashiro (Europcar). Le Gac, however, was quickly distanced. Plaza went solo in the ascent to the Puerto de Navacerrada, the first of four Category-1 climbs. The group were joined by a larger pack to form a 38-man breakaway after Gougeard was dropped: Reza & Elissonde (FDJ.fr), Amador, Visconti & Ventoso (Movistar), Zubeldia (Trek), Quintero & Cano (Colombia), Dombrowski & Howes (Cannondale-Garmin), Henao & Roche (Sky), Zeits & Sanchez (Astana), Bennett (LottoNL-Jumbo), Rojas (Movistar), Bilbao & Arroyo (Caja Rural-Seguros RGA), Oliveira & Conti (Lampre-Merida), Losada (Katusha), Montaguti (AG2R-La Mondiale), De Marchi & Moinard (BMC), Verona (Etixx - Quick-Step), Vanendert & De Buyst (Lotto Soudal), as well as Sicard (Europcar). Dumoulin looked in trouble when Landa and Aru upped the pace on the ascent of the Puerto de la Morcuera and when Aru followed up with an attack, the red jersey was dropped as only Quintana and Majka could follow. Landa, Rodriguez and Chaves made it back to the Aru group right before the summit. Dumoulin and Nieve (Sky), who was helping the Dutchman, could not follow. Zeits and Sanchez were there to help Aru and Dumoulin and Nieve lost ground, with the Dutchman crossing the line almost four minutes behind Aru. Plaza had long raided his arms, beating fellow fugitives Gonçalves and De Marchi by over a minute. 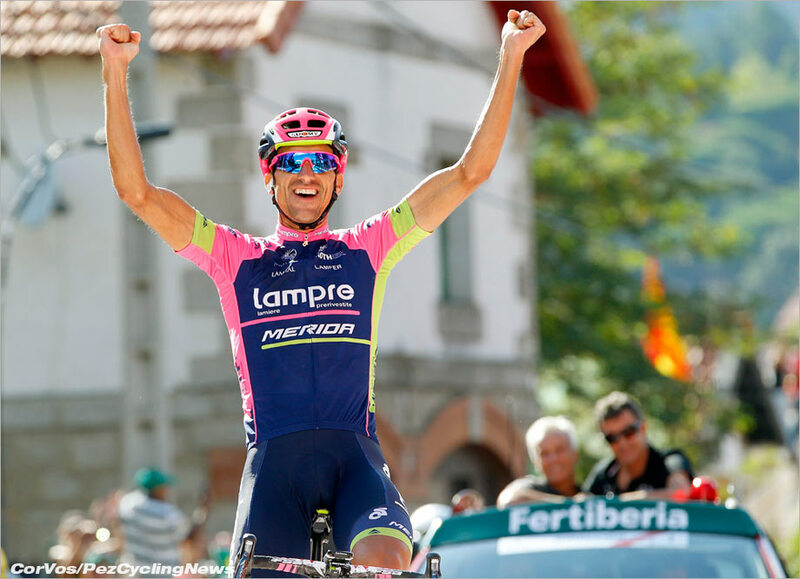 Stage winner, Rubén Plaza Molina (Lampre-Merida): “There was a moment when we were 10 in front and I heard they were 25 chasing behind. I knew it would be chaos, riders have always failed to collaborate in such big breaks in this Vuelta. So I tried to form a small group but I failed and then I went solo in La Morcuera. It’s an area I know." Overall race leader, Fabio Aru (Astana): "I thought that I had to give my best and that’s why we decided to start strong. Vanotti took the start despite breaking his tailbone in a crash yesterday, he could barely walk. We focused to give the maximum and we got this result thanks to the work of the team. He (Dumoulin) has been proving he is very strong since the start of the Vuelta, he’s an outstanding all rounder. He rode a fantastic Vuelta and I’m going to congratulate him. It was a good terrain to attack. 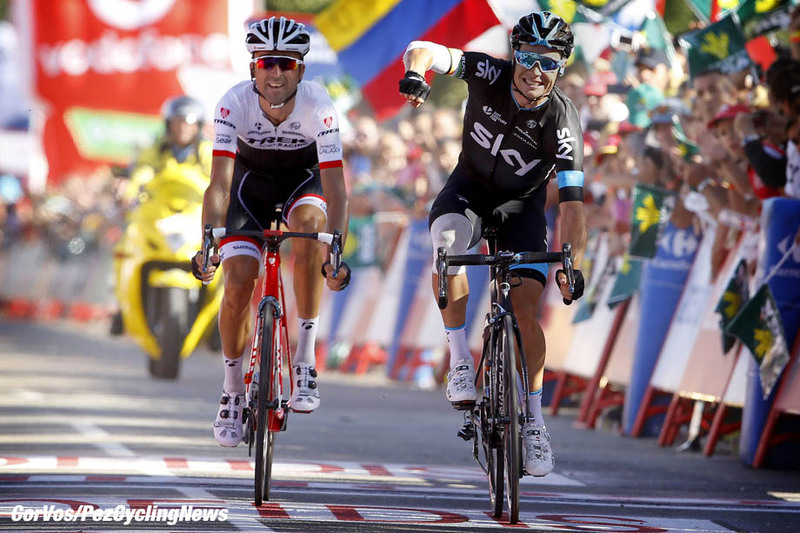 My team worked hard and Mikel (Landa) did a great job in this Vuelta, winning the stage and helping the team. When I saw that we only had 25 seconds I wanted to push harder and I saw Andrey (Zeits) and Luis Leon (Sanchez), who worked well to increase the gap." "Myself and my team mates were very motivated even after I crashed yesterday. The parcours was not easy today. This morning I could talk to Tiralongo who motivated me, but I never forget that my idol is Alberto Contador, who shows that attacking always pays off eventually. At the beginning we made a small difference and when we saw that Dumoulin was coming back, we eased up a bit to take the time to prepare another attack two kilometers from the summit. We saw he was tired." "Yes, it (the time trial) was a very important stage, there were big differences. I was prepared for this stage but I can’t say I was happy with the result although I fared better than during the Giro. I know I must work on that because it’s important on grand tours. The Vuelta was very hard and stressful and it was important to stay as fresh as possible mentally until the last day." 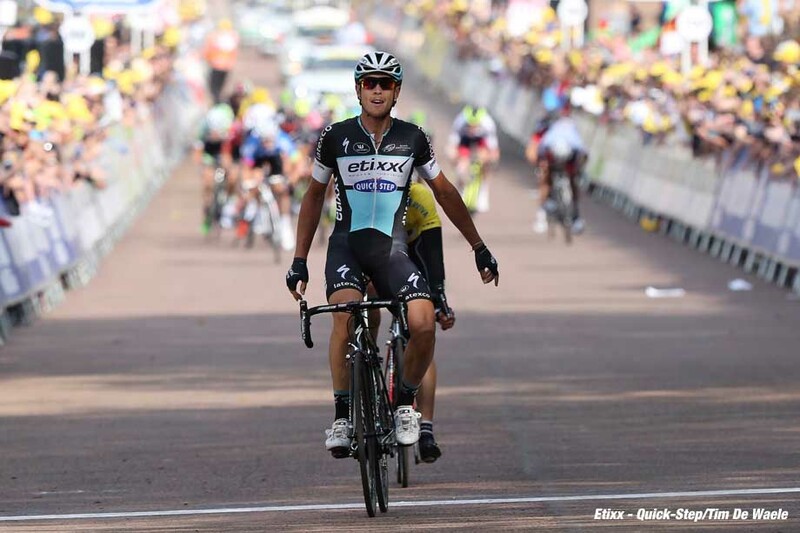 "Mikel (Landa) proved he is a great rider and a strong candidate for grand tour titles. It’s a bit sad that I won’t be able to ride with him next year because we have a good relationship. He put his ambitions aside for me and it’s not easy for a 25-year-old rider. However he managed to win two stages on the Giro and one stage on the Vuelta." "The (Worlds) course does not suit my characteristics. I talked to Davide (Rebellin) and I’m happy that another rider takes my place." "You know the relationship we have… (with Tiralongo) He’s a team mate but he’s essentially a friend who tells me when I make mistakes so I can learn. Paolo does not always tell me I’m a champion, he taught me to keep a low profile and my feet on the ground even when I have good results. I have not taken part in the Tour yet and I would love to but that’s something that will be discussed with the team when we set the goals for next year. Vincenzo (Nibali) is a great champion who has won the three grand tours and also got many podium finishes. Who is the leader is not the question, we want to get results, he has goals and I have others. He had to leave the Vuelta but if he had stayed the goal would have been the same: get a good result for the team." 3rd on the stage, Alessandro De Marchi (BMC): "In the morning, we thought it would be good to try with Amaël and see what would happen. We knew that it could be hard, so it was a good day for a breakaway. With Amaël, we tried to save energy for the last two climbs. He did a good job in the first part of the climb and then I tried to follow Movistar because they were strong. We tried to catch the Lampre guy (Plaza), but it was too late. He was too strong, so to close the gap was too difficult. For me, it is like a victory after what happened in the spring. We have fought every day and every stage. So I think everybody can be happy." Diego Rosa (Astana): "We've been trying all season to win a Grand Tour and it has finally arrived. We never gave it up for lost, but it was very difficult with withdrawals Paolo (Tiralongo) and Nibali and falling Aru. Today we started convinced. We are a great team and we did a great job. Fabio has been very strong. It has deserved it. It is his moment to win a Grand Tour." 10. Moreno Moser (Ita) Cannondale-Garmin at 2:40. Fabio Aru (Astana) claimed his first Grand Tour title when the Italian retained the overall leader’s red jersey in the Vuelta a España after John Degenkolb (Giant-Alpecin) won a bunch sprint in the Final Stage 21st in Madrid. 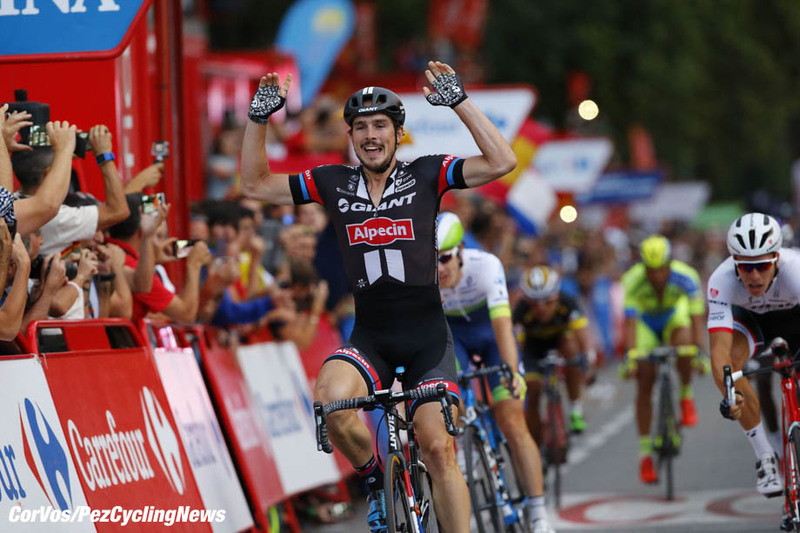 Degenkolb beat Danny Van Poppel (Trek) and Jempy Drucker (BMC). The Movistar-led peloton entered Madrid and Alejandro Valverde won the intermediate sprint to bag four points and leap-frog fellow Spaniard Joaquim Rodriguez (Katusha) in the points classification to secure the green jersey. Just like in 2012. Six men jumped away from the pack : Pichon (FDJ.fr), Fraile (Caja Rural-Seguros RGA), Montaguti (AG2R-La Mondiale), Visconti (Movistar), Verona (Etixx - Quick-Step) and King (Cannondale-Garmin). The Giant-Alpecin and Trek teams, however, controlled the gap as they were looking to set up a bunch sprint. Three laps from the finish, the fugitives were about to get caught when King tried his luck solo. He failed, just like Gougeard (AG2R-La Mondiale) and Thomas (Sky) after him. As expected, the 97.8-km stage ended in a bunch sprint won by Degenkolb after he was perfectly set up by his team. Finishing safe in the peloton, Aru secured the red jersey, the green went to Valverde while the polka dot jersey was won by Omar Fraile (Caja Rural-Seguros RGA). Rodriguez won the white jersey for the combined classification and Movistar won the teams classification. Overall winner, Fabio Aru (Astana): "I feel very happy. I dedicate this victory to the people close to me who helped me win, to all the people who follow me, my family, my girlfriend and all my fans. This motivates me to do better, to train, to live like an athlete, because to reach these results you have to make sacrifices. It motivates me to always do better because in this sport you always have to work. Dumoulin has shown in this Vuelta what a great champion he is. There are others like Pinot, he is also from 1990. It is a great generation. It is an incredible. I hardly found the words on the podium because I was so excited. " White jersey & 2nd overall, Joaquim Rodríguez (Katusha): “The last day is usually a party but I guess everyone had their ways. I see it one way, they saw it differently. I can say that I am very happy with my result. A second place in the Vuelta a España is a nice achievement after three super hard and tension-filled weeks of racing with the strongest rivals. I think I had a successful Vuelta – I took second place on the final podium, won an important mountain stage, for one day took the red jersey and won the white jersey. I want to thank my team, all the guys who gave their best to provide me a chance to step up on the podium in Madrid. I am 36 and I’m still among the best of the best. It is a pleasure to know this. I would like to congratulate Fabio Aru with the final victory in the Vuelta. It is a well-deserved and beautiful success." 3rd overall, Rafal Majka (Tinkoff-Saxo): “For me and my team this is a great Vuelta, we really did a very good job. I’m very happy. This is my dream. I have finished third in the Vuelta. The staff is also very happy. I need to learn, I’m only 26 years old. I will try to fight in the future. Maybe in the future I will try to win”. 3rd on the stage, Jean-Pierre Drucker (BMC): "With 500 meters to go, I was a bit boxed in, but I found some space. When I started my sprint, I was on van Poppel's wheel. I could still move up and was close for second. Degengkolb was simply the fastest. I can't say I am totally done. I still feel pretty good, of course, I feel the fatigue but my tank is not totally empty, so that is already a good sign. The third week, there were riders who suffered much more than me. I hope to take a lot of profit from these three weeks." 10. Tom Van Asbroeck (Ned) LottoNL-Jumbo. 20. Diego Rosa (Ita) Astana at 43:27. Points: Alejandro Valverde (Spa) Movistar. KOM: Omar Fraile (Spa) Caja Rural-Seguros RGA. Combined: Joaquim Rodriguez (Spa) Katusha. Before the final stage of the Vuelta came into Madrid, the women’s peloton took on the Madrid Challenge on the finishing circuit used by the men. The Madrid Challenge was fought out over 87 kilometers – 15 laps of 5.8 kilometers. The circuit took in some of the main sights of the center of the Spanish capital city, from the start/finish in the Plaza de Cibeles and the Gran Via, Paseo del Prado, the Plaza Neptuno and back. Shelley Olds gave her Alé-Cipollini-Galassia team a top class win, out-sprinting Giorgia Bronzini (Wiggle Honda) and Kirsten Wild (Hitec Products). After many failed breaks, the last escape was caught with 10 kilometers to go and the race was all together at the bell with the sprinters teams readying themselves for the lead-out. Olds punctured but managed to regain the peloton in time to latch onto the Hitec sprint train for Wild. The American came off Wild’s wheel and held off Bronzini all the way to the line. 10. Sheyla Gutiérrez (Spa) Lointek. Wout Poels (Sky) won Stage 5, the toughest stage of the Tour of Britain ahead of Edvald Boasson Hagen (MTN-Qhubeka) and Beñat Intxausti (Movistar) in 3rd place. Boasson Hagen looked like he had the stage in the bag with meters to go, but the Norwegian faded to allow Poels to take the victory. Boasson Hagen took the overall lead by 1 second. The break of the day included: Conor Dunne (An Post-Chain Reactions), Mark McNally (Madison Genesis), Michael Morkov (Tinkoff-Saxo) and Morgan Kneisky (Raleigh) with sprints leader Pete Williams (One Pro Cycling). Movistar and Sky kept them on a short leash. Coming into the last kilometers the break fell apart; Morkov, McNally and Williams fought on to be caught with 10 kilometers to go. Ruben Zepuntke (Cannondale-Garmin) was the first to make an attempt, but was soon pulled in to be replaced by Steven Kruijswijk (LottoNL-Jumbo). Poels went after him, caught and passed him and headed towards the finish, but Kruijswijk and Boasson Hagen pulled him back. Poels had another try, but this only spurred the Norwegian to make his attack with 1 kilometer to go. Boasson Hagen looked good for the win, but Poels had something left to get past the MTN-Qhubeka rider before the line. Stage winner and 2nd overall, Wout Poels (Sky): "It was really nice to win and the team have been working really hard today and also in the stages before. I just closed the gap - Boasson Hagen was really strong but it's a really nice win. It's pretty nice - especially now I ride for Team Sky on a home race in the UK. The people are great and they really support us. It's great to win and see all the people. It's my second victory at the Tour of Britain. I think [last time] it was 2010, my second victory as a pro. Now I'm here again. Hopefully we can take the jersey. It will be difficult but there's still three days left." Overall leader, Edvald Boasson Hagen (MTN-Qhubeka): "The team did a really good job today, especially Reinardt who rode strong to keep the break within sight. On the last climb there were a lot of attacks and it was really hard. But the climb suited me, so I tried my luck with one kilometer to go. Unfortunately, I faded in the headwind on the last hundred meters and Wout Poels passed me for the win. I’m happy though to take yellow and hope I can hold onto it. It would be nice for the team and Qhubeka to win the Tour of Britain." 10. Dylan Teuns (Bel) BMC. 10. Chris Anker Sørensen (Den) Tinkoff-Saxo. Etixx - Quick-Step rider Matteo Trentin, attacking out of an original breakaway with 9.7km remaining and with a 16 second gap, went on to win in a two-up sprint against race leader Edvald Boasson Hagen (MTN-Qhubeka) on Friday, in the 192.7km Stage 6 from Stoke-On-Trent to Nottingham. Owain Doull (Team Wiggins) was 3rd, and Etixx - Quick-Step rider Zdenek Stybar crossed in 4th out of the peloton that finished just 4 seconds down on the duo. Boasson Hagen bridged to Trentin with about 2km left of the stage with the gap at a mere 3 seconds. Boasson Hagen immediately pulled through to the front, and the two expanded their advantage enough to stay away and decide the stage. Boasson Hagen now leads the race by 13 seconds over Wout Poels (Sky). Etixx - Quick-Step is down to just three riders as Petr Vakoc and Fernando Gaviria both withdrew from the race due to crashes in prior stages, and Mark Cavendish also withdrew from the race on Friday due to a crash. Despite the bad luck so far for the team, Etixx - Quick-Step has won three stages and been on the podium for five out of six stages. Stage winner, Mateo Trentin (Etixx - Quick-Step): "This stage was full gas, as basically the whole race has been, from the first kilometer, there as a climb at the beginning. There was a crash involving Cav and other riders, and that caused a split in the peloton. I was in the front group with 40 or 50 riders. When reached the top of the climb we arrived at a field, with crosswinds on the right side. The peloton split into two pieces this time, and riders were attacking and countering all the time. The speed was crazy with all of the attacks. Eventually there was an attack with Styby and other guys. Then when the peloton caught this breakaway, I went away with five other guys, and that became a breakaway. There was a lot of fight in the small peloton, but we collaborated really well. At a little less than 10 kilometers to go they were closing in on us, as we had Izaguirre in the group and he is a threat for the GC. At that point the breakaway stopped collaborating. So, I decided to go alone and give everything. I was hoping once the peloton caught the others, including Izaguirre, they would stop chasing as the overall was no longer at risk. That more or less happened, but then Boasson Hagen attacked and I thought 'great, now they will catch me for sure.' But I saw he had a gap to the peloton, so I kept on riding anticipating that he would jump to my wheel. He did, and then I jumped on his wheel. We managed to gain a few seconds. In the finale I launched my sprint from far. I was able to pass him and win. For me, this win is something great. It's my third victory in 15 days. I feel really good. To be able to go alone like I did and stay away, and then win in a two man sprint, it means a lot for me. I think I still have small room to improve, which can only be a good thing in the next races. I'm looking forward to the next few weeks." 10. Wouter Poels (Ned) Sky. 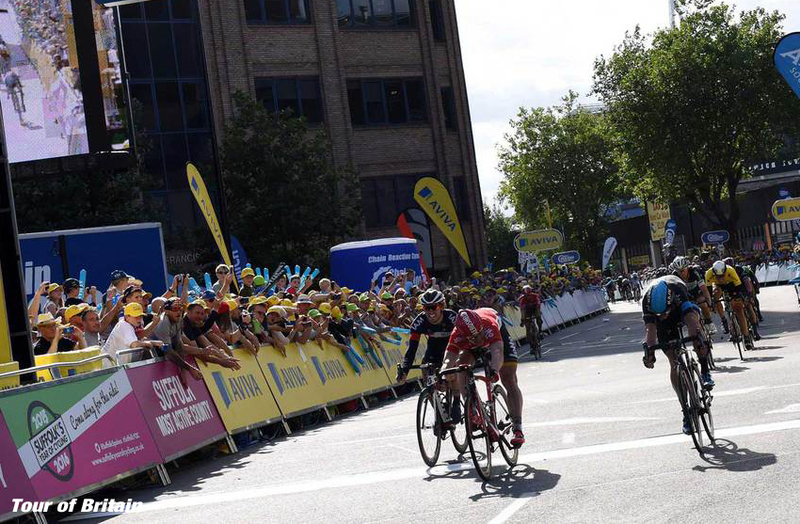 André Greipel won Stage 7 in the Tour of Britain. He defeated Elia Viviani after a very close sprint. Three escapees went clear after a very fast first hour: Dowsett, Briggs and Cullaigh. Before halfway they got a maximum of nine minutes on the bunch, where Lotto Soudal controlled the race. The gap of the escapees went down and at ten kilometers from the finish they were caught. Sky, IAM and Lotto Soudal were the dominant teams during the preparation of the sprint, but André Greipel was the fastest of the whole bunch. Stage winner, André Greipel (Lotto Soudal): “It was a close victory, but the photo finish was clear I think. We took control of the race from the beginning, no other team wanted to help us. When the gap was nine minutes, one rider of IAM also started to pull. Frederik Frison and Sean De Bie kept the peace high so nobody could attack. Pim, Sibi, Jens and I did the preparation and the sprint. I think we deserved the victory, Sky won already three stages. The first stages we wanted to help Jens to a victory, but we had some bad luck. Because the teams started with six riders and some lost already two or three, it’s difficult to control, also because everybody is tired after a hard week. Tomorrow we try again, but not without help from other teams. They predict rain, we’ll see if Jens or I will sprint." 10. Jens Debusschere (Bel) Lotto Soudal. 10. Xandro Meurisse (Bel) An Post-Chainreaction at 1:02. 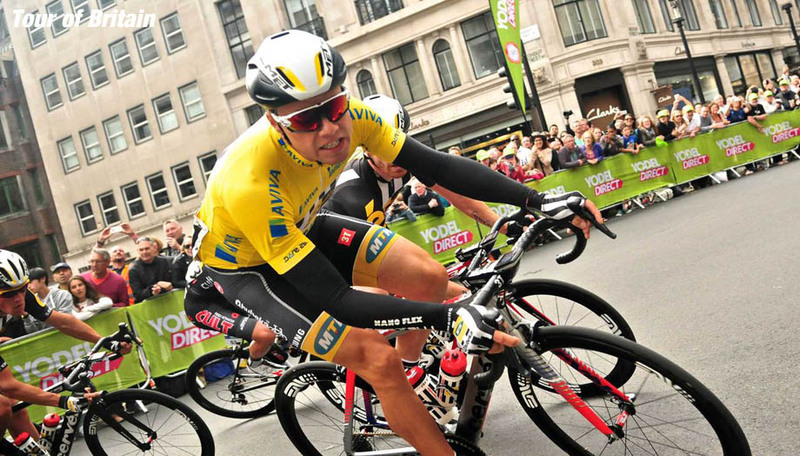 Edvald Boasson Hagen secured the overall win at the Tour of Britain on Sunday when he crossed the line of the Final Stage 8 in London in 4th place. The stage win was awarded to Elia Viviani (Sky). The Italian crossed the line in second place behind André Greipel. Yet the German had crossed Viviani’s line, pushing him towards the barriers. The race commissaires relegated Greipel, giving the Italian his 3rd win this week. Juan Lobato (Movistar) moved up to 2nd, Matteo Trentin (Etixx - Quick-Step) to 3rd. The stage in the heart of London was animated be an 8-man break with last year’s overall winner Dylan van Baarle (Cannondale-Garmin). The group went clear after the first intermediate sprint and stayed away until 10 kilometers to go. Team MTN-Qhubeka kept control over the race for most of the day, keeping Edvald out of trouble. The Norwegian champion took the overall ahead of Wout Poels (Sky) and Owain Doull (Wiggins). 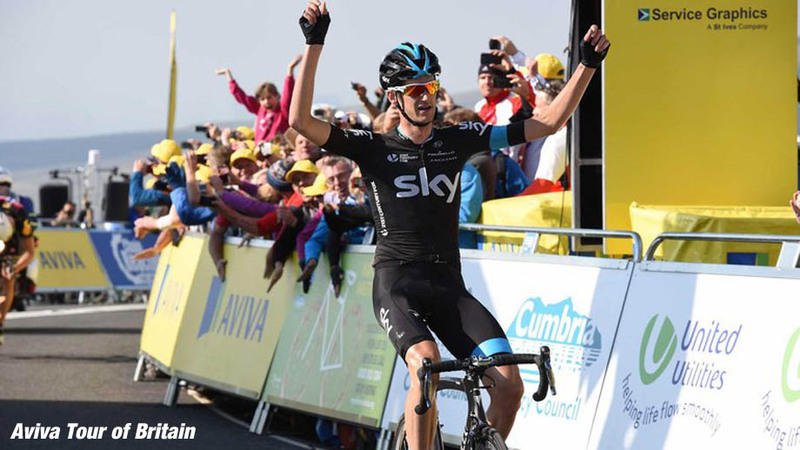 He is the first double winner of the Tour of Britain in the history of the race. Overall winner, Edvald Boasson Hagen (MTN-Qhubeka): "The team did a fantastic job today. The pace was quite high from the beginning but we stayed in control for most of the time. When the group went we kept watchful. I’m really happy to win the overall. It has been a fantastic week with good crowds and a good support, also in terms of our 5000 bikes campaign." Danilo Wyss (BMC) most aggressive rider: "When I saw it was a technical course, I knew it would be easier in the front. That is why I tried so hard to be in the breakaway, I was surprised I had fresh legs and was feeling really good today." 6th on the stage, Sondre Holst Enger (IAM Cycling): “The final day was difficult and we rode à bloc throughout the stage. It was beautiful nonetheless to race in this environment, and I received a lot of help from my teammates. I was well placed at the beginning of the last kilometer but then I lost a few places. It was therefore impossible to play for the win." 10. Owain Doull (GB) Team WIGGINS. Etixx - Quick-Step's tactic in the final kilometers worked to perfection, as they attacked or chased down moves incessantly with Julian Alaphilippe, Michal Kwiatkowski, and finally Rigoberto Uran in the 201.6km Grand Prix Cycliste de Québec on Friday. Uran's attack heading into the last kilometer turned out to be the winner, earning Etixx - Quick-Step its 51st road win of 2015, and the second win for the team on the same day. It is the second victory of the season for the Colombian rider, who is also the Colombian ITT Champion. Grand Prix Cycliste de Québec is known for attacks conditioning the race, particularly within the final lap. The race is a 16-lap circuit of 12.6km for a total of 201.6km. It is a course for climbers and skilled descenders, and also includes an uphill finale. The climbs of the race include Cote de la Montagne (375m, 10% average gradient), Cote de la Potasse/Des Glacis (420m at 9% average gradient), Montee de la Fabrique/Des Jardins (190m, 7% average gradient), and Montee du Fort/Saint Louis/Grande Allee (1km, 4% average gradient). Alaphilippe attacked with 1.9km remaining, before Robert Gesink (LottoNL-Jumbo) bridged to him. However, the peloton brought both of them back prior to the flamme rouge. There was some disorganization at the front, and that is when Uran accelerated, drifting off the front, and successfully holding off the peloton for the win. Greg Van Avermaet (BMC) and Kwiatkowski also went off the front with 3.6km to go, and eventually they were caught to form a lead group of about 13 riders. However, there was a regrouping with 2.7km remaining. Race winner, Rigoberto Uran (Etixx - Quick-Step): "For me this is a big relief after a season that was a bit unlucky, with a lot of small problems, but I never gave up. After Le Tour de France I said 'ok I have to keep the concentration and effort up.' I worked hard to be ready for this point of the season, and the result is there with a victory. I knew this race well, I was 3rd in 2011. I knew with this parcours that there is a chance to anticipate in the last kilometer, and I did it. I kept going on, gave everything and I won. Now I know for sure the condition is there. On Sunday we have another race, but on paper it is a little less selective than today in Québec so there is less chance for me to do well. But I am confident in my sensations, and also confident in my teammates who arrived with good motivation. These are strong guys who arrived physically ready, and it showed with how we attacked in the final kilometers. After these races in Canada have the UCI World TTT Championship coming up in the next days, and then there is the UCI World Individual Time Trial Championship. So, there is a lot of room to keep doing well for the team. It'd be nice to do well in the TTT. We'll see, but for now I'd like to enjoy this victory." 3rd, Alexander Kristoff (Katusha): "I tried everything I could, but the circuit was a little bit harder than last year because they pulled out some of the flat sections. I knew the finish was not perfect for me – actually if the finish could have been anywhere else in the parcours it would have been better than where it was. So with that in mind, I’m pretty happy with a third place. Sunday’s climb is too hard for me – the finish is better but the course is heavier so I don’t think I’ll be there. I will use Montréal for training as I look forward to the Worlds. When I think about how I feel before Richmond, I can say I felt better today than I expected. Last year I was not 100% at the Worlds so I hope to be better this time. Today was a good confirmation of my shape." 5th, Diego Ulissi (Lampre-Merida): "The plan for the race we had agreed with the sport director Pedrazzini was good and the race confirmed that the choice to pedal in the middle of the bunch for most of the laps was the best one. The course, in fact, was favorable for the chasers when the pace of the bunch would have increased. In the final lap, my legs were still good, also thanks to the support of my teammate I recovered positions and I was in the front of the peloton for the sprint, in which I battled for a place on the podium against very fast riders. Uran deserved the victory, he attacked in the best moment and he had the energies to reach the finish line." 10. Greg Van Avermaet (Bel) BMC. 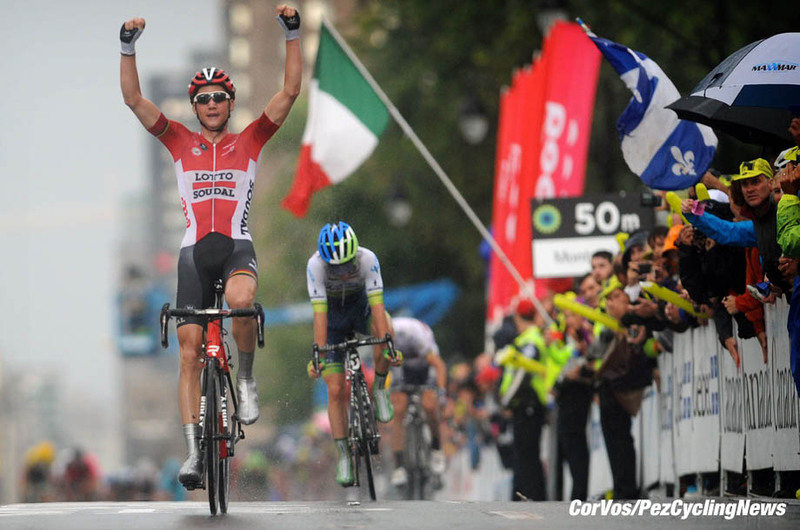 Tim Wellens (Lotto Soudal) won a very wet GP Montreal on Sunday, beating breakaway companion Adam Yates (Orica-GreenEdge). Rui Costa (Lampre-Merida) won the bunch sprint for 3rd. Yates and Wellens made a late attack on Mont Royal and kept clear of the chasers to fight out the two-man sprint, with the Belgian getting the better of the Young Brit. The break of the day was made up of: Silvan Dillier (BMC), Romain Bardet (AG2R-La Mondiale), Michael Valgren (Tinkoff-Saxo), Michal Kwiatkowski (Etixx - Quick-Step), Warren Barguil (Giant-Alpecin), Michael Albasini (Orica-GreenEDGE) and Jakob Fuglsang (Astana). They were joined by Brent Bookwalter (BMC), Jose Herrada (Movistar), Wilco Kelderman (LottoNL-Jumbo) and Matteo Bono (Lampre-Merida). Kwiatkowski was the strong man in the group and at one point went solo before they were all caught. The next important split included: Thomas Voeckler (Europcar), Louis Vervaeke (Lotto Soudal) and Manuel Quinziato (BMC), Christopher Juul Jensen (Tinkoff-Saxo) and Andriy Grivko (Astana), they built up a lead of 2 minutes with 4 laps to go. Orica-GreenEDGE chased them down to be caught on the last lap. On the last climb of Mont Royal, Yates attacked and was joined by Wellens. Bakelants, Bardet, Costa and Kelderman were casing at 12 seconds with the peloton at 20 seconds at 3 K's out. With the chasers on their heels Wellens took the win from Yates. 2nd, Adam Yates (Orica-GreenEDGE): "Wellens was super strong, and all the way in toward the finish he was doing the most work and giving the biggest turns. He wasn't just the strongest at the finish but also from the top of the last climb. I'm happy with second and I'll come back next year to try and do one better." 10. 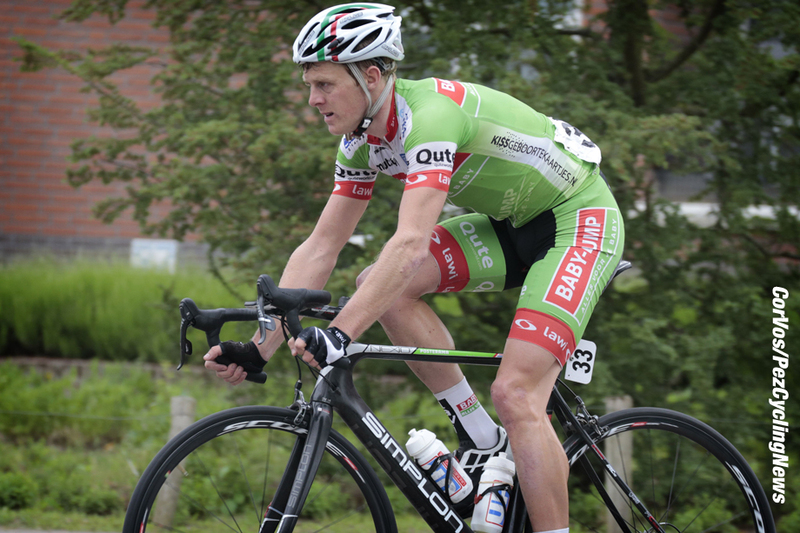 Tom Jelte Slagter (Ned) Cannondale-Garmin. The Union Cycliste Internationale (UCI) and Richmond 2015 Organizing Committee have today announced the 2015 UCI Road World Championships schedule and course modifications of the eight-day event that will take place from 19 to 27 September 2015 in Richmond, Virginia, in the United-States. A slight modification has been made to the Road Race course in downtown Richmond, with racers now turning left at Main and Belvidere streets to head to Broad Street before returning to Main Street at 2nd Street. Concerning the Team Time Trials course, the start venue has been changed from Rocketts Landing in Henrico County near Richmond’s downtown to Lewis Ginter Botanical Garden in Henrico County just north of Richmond. The shift showcases one of Richmond’s iconic landmarks along with the Richmond National Battlefield Park, already featuring in the original course. Lotto Soudal is very happy to announce that Kris Boeckmans is no longer kept in an induced coma and that the recovery is evolving positively. After the ECMO treatment was stopped and the drain was removed from the thorax, the past 48 hours the tracheal cannula in the trachea was taken away, the external oxygen supply and the anesthesia in function of the induced coma were phased out and stopped. Aforementioned steps have passed without complications, that’s why Kris has awakened out of his coma. The attending doctors took a detailed scan of the whole body, just as a matter of control and to trace possible hidden injuries. No other injuries then the ones mentioned before, were detected. This positive evaluation made it possible for Kris to talk with his family and the doctors. He remains at the intensive care unit for further observation. One of these days, Kris will be repatriated with a medical flight, accompanied by a doctor and the required equipment. Afterwards he will be brought to a Belgian hospital for further recovery. The rib fractures will have to heal in a natural way. Also the lung injuries will need their time to evolve. The facial fractures will be treated surgically after a thorough analysis in Belgium. The BMC Racing Team lost Floris Gerts and Dylan Teuns to a crash Saturday at the Aviva Tour of Britain while Taylor Phinney withdrew from the race before the start. The crash with Gerts and Teuns happened as the race diverted onto a runway at Wattisham Airfield for an intermediate sprint in the 224.1-kilometer race, the longest of the eight-day event. "I hit a hole and lost hold of my handlebars because it was a really big hole," Teuns said. "I totally lost control so I did not have a chance. I just went to the ground." Teuns landed on his head, as did Gerts, BMC Racing Team Dr. Scott Major said. "Because of the concern about a head injury, we took them to the hospital as a precaution," Dr. Major said. "Neurologically, both riders are fine. But we are going to have them under close observation the next 24 hours." Teuns was the more seriously injured of the two with abrasions on his left side and a large gash to his left elbow. 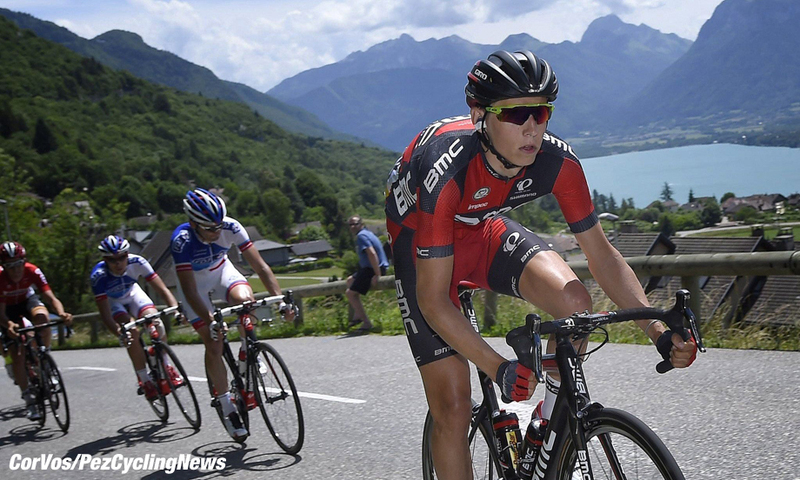 X-rays on the elbow were negative, but Teuns did require some stitches to help close the wound, Dr. Major said. Phinney did not start due to fatigue. "It has been a hard race with long stages and long transfers," Dr. Major said. "Coming back from such a long layoff and injury and competing in his third straight stage race, we felt it was important for his worlds' preparation to get some much-needed rest and recovery." Stefan Küng, who joins Danilo Wyss as the only two BMC Racing Team riders remaining in the race, also crashed Saturday in a separate incident. But the world individual pursuit champion was not seriously hurt. BMC Racing Team Sport Director Fabio Baldato said it was unfortunate to lose Teuns - who had been sitting fifth overall - and Gerts, a stagiaire who had been as high as third place overall earlier in the week. "Dylan was enjoying a good result for a young guy," Baldato said. "Now we will arrive in London with two guys. Fortunately, it looks like the injuries are not too bad. That is the only good thing." Team Katusha, number 1 in the UCI WorldTour rankings, is happy to announce two signings for next season. On September 10th Belgian rider Jurgen Van den Broeck signed a contract for the 2016 season. Also, the German U23 road champion Nils Politt signed an agreement for two years with an ambitious Team Katusha. Jurgen Van den Broeck (32) is the current Belgian time trial champion and a specialist of Grand Tours. Van den Broeck finished 3rd (2010) and 4th (2012) overall in the Tour de France. Also in the Giro d’Italia (6th in 2008) and the Vuelta a España (8th in 2011) he finished in the top ten. "After nine years in the same team it was time to move. I missed the confidence of the team in me. At the same time there was a concrete interest from Team Katusha. Already in 2013, in the period of my knee problems, Viacheslav Ekimov and José Azevedo asked me regularly about my health problem. They encouraged me not to give up. They were, and still are, convinced I will once again reach the highest level. When they asked me some time ago to join Katusha, I felt it immediately as a grand honor. I know Ekimov and Azevedo from the period when I was a neo professional. They were experienced riders and I learned so much from them. In whatever Grand Tour(s) I will start next year, I will give my maximum - for myself and for the old or young teammates. I will start again with the ambition of a junior rider," said Jurgen Van den Broeck. As a junior rider Van den Broeck became World Champion in the time trial. On September 23rd Van den Broeck will start in the World Championships time trial (Richmond, USA). In Richmond he will meet Nils Politt who will participate in the U23 road World Championships. Nils Politt (21) is one of the best German U23 riders of 2015. He impressed Team Katusha’s management during last Bayern Rundfahrt where he finished 6th amid all WorldTour riders. For Team Stölting he won the German U23 Road Championships and finished 2nd in the national Time Trial Championships. In 2014 he won the German U23 Time Trial title. "I am so happy that Team Katusha wanted me in their team. Several months ago they showed interest in me. I love the Belgian and French classic races. I look forward to helping Alexander Kristoff in the coming seasons. I am sure I will learn a lot in this team. I will need to work a lot but I will sacrifice myself with pleasure for the team. My first acquaintance with the team will be the Tour Eurométropole at the end of September. I will start there as a Katusha trainee. I look forward to it," said Nils Politt. "It was never easier for us to find riders motivated to join our team as this year. Being the current leader of the UCI WorldTour ranking helps a lot, but also the atmosphere in the team was never better than in 2015. With Nils and Jurgen we have again two new strong riders in the team. The palmarès of Jurgen Van den Broeck tell us enough about his capacities but I remember Jurgen from his first years as a pro rider and he is still the same: one hundred percent professional and prepared to be a team player. He will surprise us again. I hope Nils can do the same. Maybe already in Richmond, just as Sven Erik Bystrøm did last year. Why not?" concluded General Manager Viacheslav Ekimov. Trek Factory Racing is pleased to announce it has signed Haimar Zubeldia and Boy Van Poppel to one-year contract extensions. Haimar Zubeldia finished five times in the top eight of the Tour de France. The Spanish rider from the Basque Country brings a wealth of stage racing experience to the entire team. Twenty-seven-year-old Boy Van Poppel, in addition to being an outstanding locomotive and lead-out man for TFR’s sprinters, has been propping up the Classics team since joining the team in 2014. Van Poppel’s 2015 season took a decisive turn in an ungodly edition of Ghent-Wevelgem when road dirt entered his eye and he had to fight a lasting eye infection for several weeks. Germany: Bora-Argon 18, Team Giant - Alpecin. 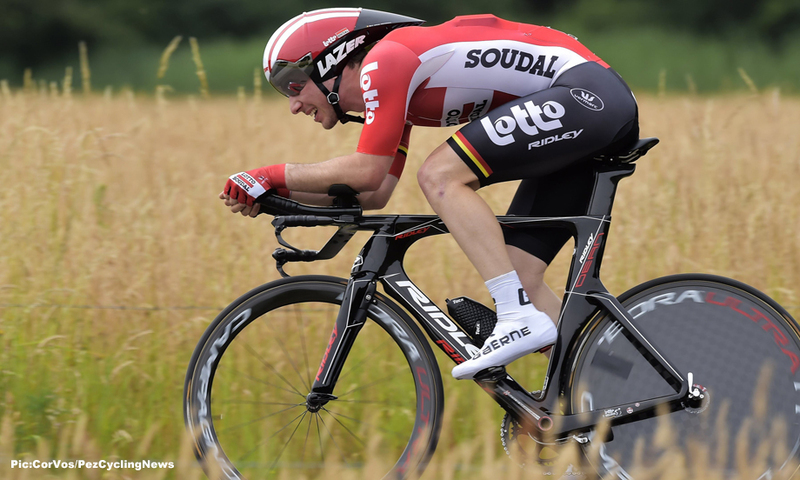 Belgium: Lotto Soudal, Etixx - Quick Step, Topsport Vlaanderen - Baloise, Wanty - Groupe Gobert. United States: BMC Racing Team, Team Novo Nordisk, Trek Factory Racing. France: AG2R La Mondiale, Auber 93, Bretagne-Séché Environnement, Cofidis, Solutions Crédits, FDJ, Equipe Cycliste de l’Armée de Terre, Roubaix Lille Métropole, Team Europcar, Team Marseille 13 kTM. Netherlands: Roompot Oranje Peloton, Team Lotto-NL Jumbo. Team Novo Nordisk has received an invitation to Paris-Tours, which will mark the team’s second appearance at an ASO race this year. The team is excited to return to France for the historic one-day race on October 11. Team Novo Nordisk CEO Phil Southerland: “One of Team Novo Nordisk’s major goals since the start of the season was to receive an invitation to Paris-Tours. Our committed staff and dedicated riders have already made 2015 our most successful season to date and we will come to Paris-Tours ready to fight for more results. On behalf of the entire team, I want to thank ASO for inviting us to race at Paris-Tours as it will allow us to reach even more people around the world and show what may be possible with diabetes." How not to be aero! Any comments drop me a line, email address: [email protected] or Twitter. And check the PezCyclingNews Twitter and Facebook Fan Page.